Three years ago today, Marissa came home to us from the hospital. She was finally ours. When I look back, 2 1/2 months, or 79 days, does not sound like that long of a time. But then I think about how long ago her birthday was and it just amazes me that we went that long without being able to bring our girl home. We are going to spend today having fun and celebrating Marissa. I think we'll go back to that park we visited on Friday. And yes, I will remember the sunscreen for all of us today! I am going to link you back to the post I wrote a year ago about this day. I just don't have it in me to write a post today. We are about a week and a half out from Rissa's big surgery and I find myself struggling to find the words to express how I feel today. Preparing my heart and mind for my baby to undergo an operation is always a surreal experience. But the fact that this is such a life changing surgery that has so much riding on it's success has put me in a different place than I have ever been before. Add to that the fact that a wonderful family just said goodbye to their sweet angel, Carter Jay, yesterday, and I just can't bring myself to write today. I am just going to hug, kiss, and love Marissa more today and thank God she is here. So, here is the post I wrote about Marissa's Homeaversary a year ago. It pretty much says it all. Today, Marissa and I went out to our city's newest playground, Swing High. It is a universally-accessible playground that accommodates children of all different abilities. I was impressed. The structure has ramps that go all the way to the top, so kids in wheelchairs can feel like a part of the action. There are about 7 or 8 different slides (Marissa's favorite) and the majority of the ground surface is rubberized. There is a big boat type structure that rocks back and forth and is wheelchair accessible. There is a big sand pit (underneath the big flower) that has lots of different, cool toys for digging and playing. Hopefully we can take Marissa in the sand by the end of the Summer. Very cool! I give it two thumbs up! Marissa had a blast on all the different types of swings. She didn't want to leave but we had to after about an hour. I, of course, slathered Rissa up with SPF 50 but forgot some for myself. The 85 degree sun was beating down on us (at 10:00 am!!) and I didn't want to burn to a crisp. But I assured her that we will be back as many times as we can this Summer. I do believe this is our new favorite park! I am so glad this playground was built. Even though Marissa is not in a wheelchair, she is a little slower in learning how to negotiate playground equipment. She seemed more comfortable running around on the rubberized surface and climbing up on the equipment that was wider, lower to the ground, and had better hand grips. I can really see kids in wheelchairs loving this park. I pulled this quote from the Swing High website. It is from a child who has played on "less than accessible" playgrounds in the past. This quote sums up exactly why every town should have a park like Swing High. So Get Out Your Seat and Jump Around! Marissa's new source of Summer Fun! Her face when she was told it was time to go inside. And when she was bad, she was horrid. Don't you just love the many faces of our goofy Rissa Roo? Quick update: After my last post, we all had the night from hell. Marissa woke up at 2:30 in the morning when her pulse ox alarmed because it wasn't picking up correctly. She normally sleeps through it but not this time. After an hour and a half of trying to put her back to sleep, we finally gave up. Jeremy was able work from home Thursday and Friday, so we had a 4 day weekend to rest up and see if we could get Marissa's attitude on track. A very encouraging development: Marissa was relatively well behaved because her Daddy was here. While it makes me a bit jealous that she will behave for him and rails so hard against me, it is good because it makes us more confident that we are not looking at a medical reason behind her outbursts. She is just darn sick and tired of being around me all the time and she takes it out on me! She has had her ups and downs this morning but overall, I think the long stretch of Daddy time was good for her. She seems to be a little milder this morning. And, I was able to get out Friday evening and go see a good friend who is 8 months pregnant. We had Chinese takeout and talked for about 5 hours, before we realized how late it was. So good for my soul! So, thank you for all the support, love, and prayers! Keep up the good thoughts and prayers, they seem to be working! A follow up to this post, to give you reference. I've known adversity in my life. I've known true sorrow. I've lost loved ones and had my heart broken many times. Looking back, all of this was pretty typical, pretty normal in relation to what everyone goes through in this life. I used to think I had lived through some pretty tough times. Up until four years ago. Four years ago, I found out I was pregnant on the Friday before Mother's Day. Then I miscarried my baby over Memorial Day weekend. From that point on, I have felt the rain falling on my life and in my soul. At different times, in different ways. I got pregnant with Marissa four weeks after my miscarriage and almost miscarried her as well. It rained throughout my pregnancy with Marissa, through the time I was told she had an anomaly in her brain, a two vessel umbilical cord, and was small for her gestational age. Through the amniocentesis that gave no answers, through the genetic consults, through the time when I was urged to terminate. It rained when I was told she had stopped growing sometime between 31 and 34 weeks, that she was breech and they would not be able to turn her. It rained when I was told I needed to have a c-section. It rained when she was born and was taken to the NICU to be put on life support. It rained every time she had to be re--intubated. 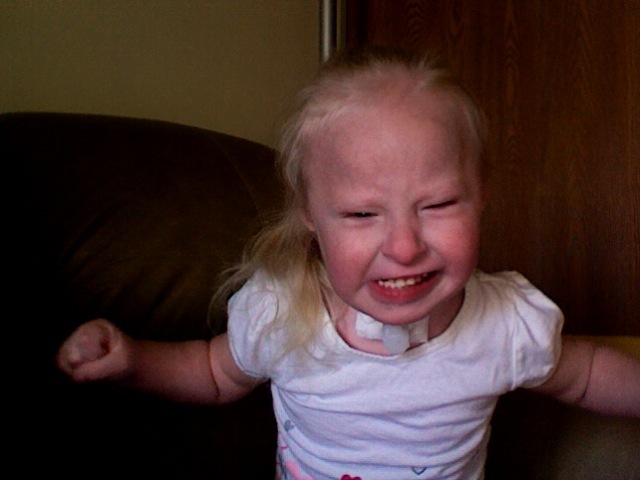 It rained when we were told she needed heart surgery, when it was decided she needed a trach and g-tube. It has rained off and on since we brought her home on May 31st, 2007, through the different procedures, surgeries, and illnesses she has had to endure. And now, it is raining through these times, when I can not figure out how to spend the day with my girl without her throwing constant tantrums. All of this is not to say that there have never been any sunny days in the past four years. Quite the contrary. There have been many times when the sun has come out, nice and warm, healing the hurts. I would even venture to say that there have been more sunny days than rainy ones. But the sunny days are always tempered by the knowledge that there is a rain storm lurking on the horizon. The rain is ever-present. Now, before you go thinking that this is sounding like a commercial for Prozac, I want to list the positive aspects of rain. Rain makes things grow. Just like the rain makes the flowers, trees, and grass grow, rain in my life over the last four years has made me grow. Having Marissa here has made everyone who meets her grow. All of the negative things we have experienced with her issues have made us stronger. Rain cleanses. It washes dirt, muck, and grime away. Every time, after the rain stops, I feel refreshed and renewed. Clean. And, once again, the sun comes out and makes me smile. Rain gives life. Looking back, I did not feel truly alive until Marissa came along. I had fun, I loved, I felt happy. But I did not truly live until she was here, problems and all. Sun always follows rain. Long periods of rain make me appreciate the sun even more. Without the rain, how can we truly appreciate the sun? We would take the sun for granted, become complacent, and stop growing. *edited to add* You can dance in the rain! One of my friend Ann's favorite quotes is "Life isn't about waiting for the storm to pass. It's about learning to dance in the rain." Isn't that beautiful? Rain brings rainbows. God's promise that He will never leave us to die, cold, scared, and alone. A promise that He will cover us with His grace, not because we have done anything to deserve it, but simply because we are His. Rain can be a good thing. And we will see the end of this rainy season, knowing the next one is waiting nearby. And, by God's grace, we will survive. Can you let me a hand? My apologies, Blogger is cutting half of the video off because it is so big. Once the video starts, you can click anywhere on it and it will take you to YouTube so you can see the whole thing. Warning: Vent and rant session dead ahead. Continue reading at your own risk. Marissa and I have been really struggling for about the past three weeks. She is throwing almost constant temper tantrums. I'm talking running away screaming, slamming doors, throwing herself down on the floor, yelling, crying, writhing, flailing, thrashing like a crazy person. She saps all my energy and has me in tears by about 10:30 am every morning. The most ridiculous part is she throws a temper tantrum over everything. EVERYTHING. Even the things she has asked for and I am in the process of giving to her. Example: She will ask for a cracker by saying "I want cracker, please. ", which is great! Polite and everything! I get a cracker for her and as I am handing it to her, she throws her hands up, yells "NOOOOO!!!" and runs away screaming! What in the world am I supposed to do with that? She also throws tantrums just for the sake of throwing them. Example: Yesterday she was throwing a fit because she wanted her rag (started out as a burp rag when she was younger and has turned into an attachment item). I told her I wanted her to ask nicely for it and then I would give it to her. She did, so I gave it to her. She then threw a fit (because I gave it to her??) and started flailing around, whipping her rag around in the air. She then said "I want ra....", realized she had the item she was about to demand, stopped dead in her tracks for about a second, and threw herself on the floor, crying. WHA?????? I have been feeling lately that she is here for the sole purpose of driving me insane. I think she is accomplishing her mission. I have tried so many things: talking rationally and calmly to her; time-outs; spankings; taking toys and privileges away for a short time and giving them back when she has been tantrum free for a period of time; giving her choices when I can; ignoring the behavior; mimicking her behavior back to her. I try to be consistent but I will use different methods if one is not working. I know I probably don't handle every situation as well as I should every time, but I am at the end of my rope. It has gotten to the point that I don't enjoy my time with her anymore. This makes me very sad. She is going to have a major, life-changing surgery in less than a month and I want to cherish my girl right now. She makes it so hard. I understand that she is trying to assert her independence and she is trying to figure out her place in this world, separate from me. I understand that she is still having some issues with communication and it is frustrating for her. I understand that it is in her nature to fight. She was born fighting for her life and she maybe still feels that is the only way she will survive. I understand that much of her behavior is typical but I do wonder if we are looking at a true medical behavior problem. I understand that she lives in a world where she has historically had very little to no control. She has been forced to do this or that, forced to comply with people poking and prodding her for the entirety of her life thus far. That is why I try to give her choices when I can. But even giving her choices sends her into a tizzy most times. I'm not sure how much longer I can keep this up. Please pray that I can endure her constant tantrums, that she will change her behavior soon and we can go back to being loving and kind to each other. I really miss my sweet girl and I want her back. In other, mostly related news, today is the third anniversary of Marissa receiving her trach and g-tube. May 9, 2007. For three days, she was given a paralytic drug. She needed to lay perfectly still so the trach site could heal properly. We did range of motion exercises for her on her arms and legs, so her muscles and joints would stay loose, but we could not hold her. That was so hard on this Mama's heart. But that wasn't even the best part of that day. After 3 1/2 days I was finally able to hold my girl for the first time after her trach was placed! I held her for hours and my heart was so full! She was even awake and alert for a short time. Happy Mother's Day to me! I hope you all are having a wonderful Mother's Day!